As soon as spring arrives, our garden becomes a playground for families of birds. 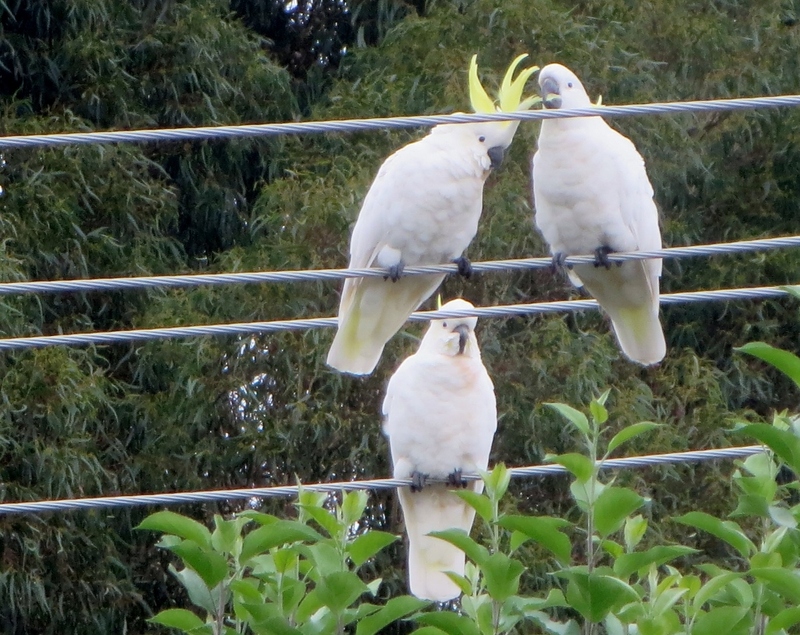 On this cold spring day the Cockatoos have perhaps given up on flying lessons for this big family……far too cold …. 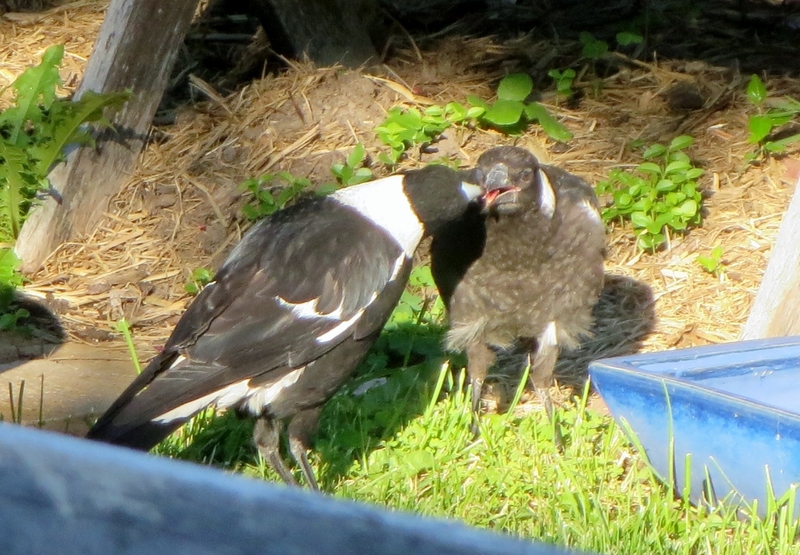 But on a brighter day, the babies are growing up…….. parents of all persuasions are a pretty tolerant bunch. 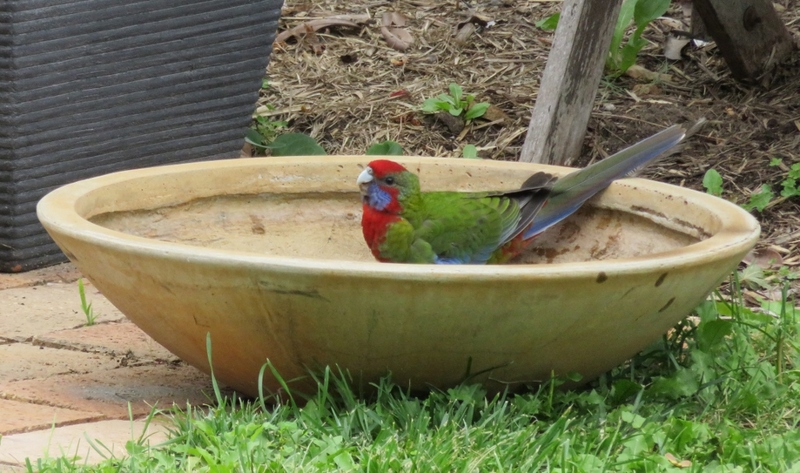 This sweet looking Crimson Rosella, no doubt a parent, is watching on from the Japanese Maple, while the young ones enjoy the birdbath, and even better……..
………a sprinkler shower as well! 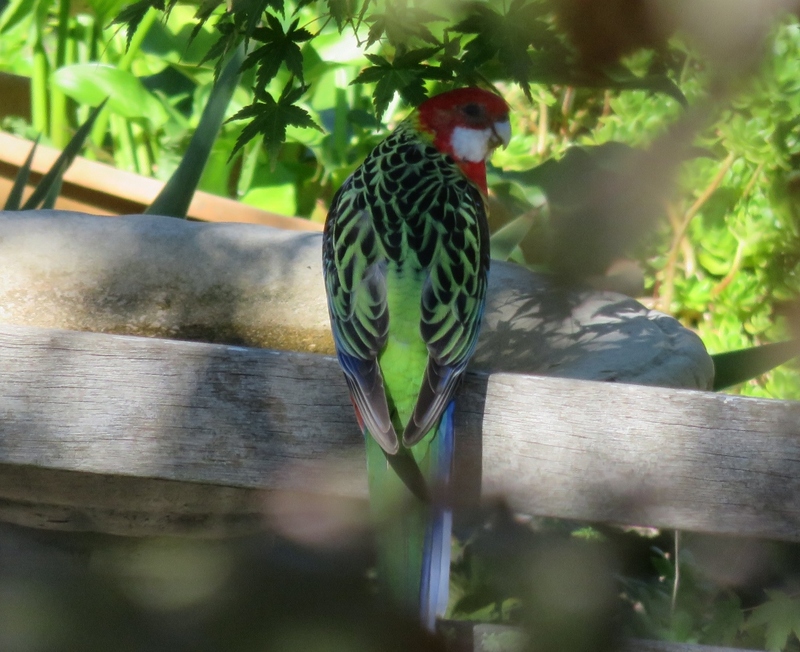 This little one is a Juvenile Crimson Rosella, and she is moulting and changing from green to red. At the moment she has nice red pantaloons, but is looking a bit awkward…just as most teenagers feel at times.. This one is also changing colour, but she is a real water baby and spends all her time happily in the birdbath.. 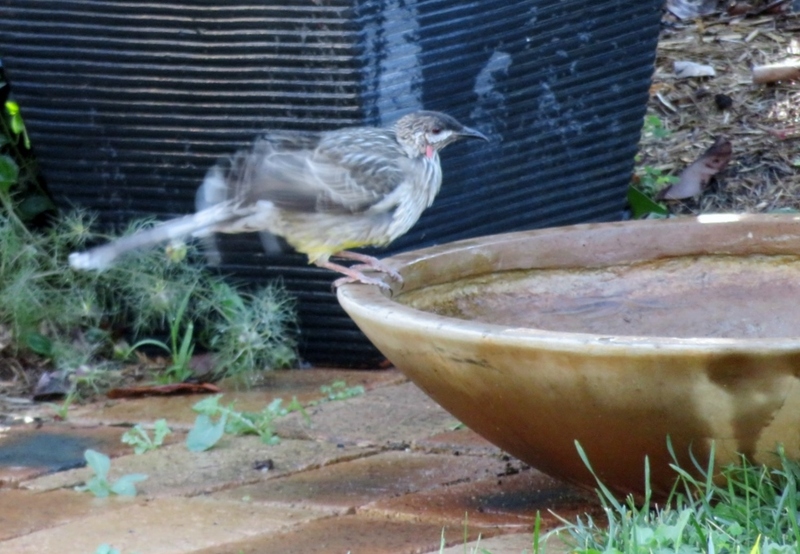 The young Wattlebird is as hyperactive as her parents, and the mere thought of the water is sending her into a spin! Kookaburras are not that common in our area, but this young one has, perhaps, come down from Mt Taylor in search of water. 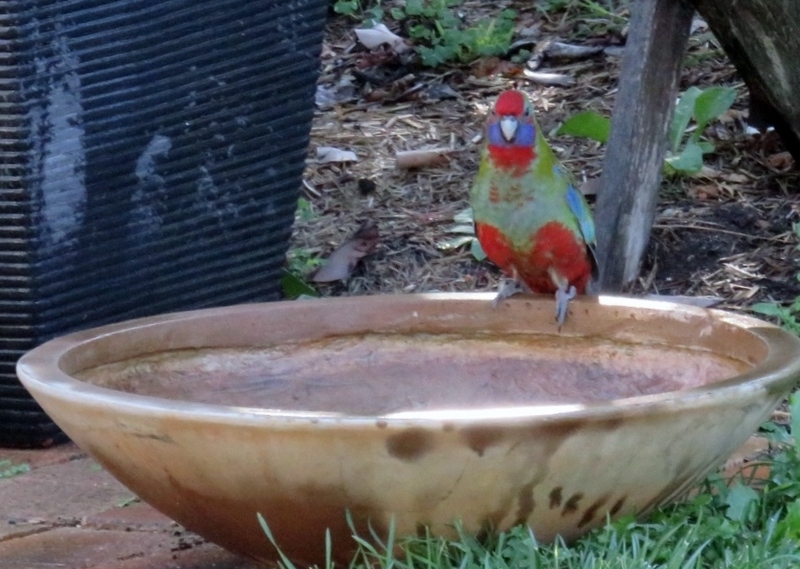 Galahs are always found in family groups, but this little one has found his way here to our Bottlebrush bush on a very hot day…but waiting politely for his turn in the birdbath..
Lovely to see these colours on a hot day.. 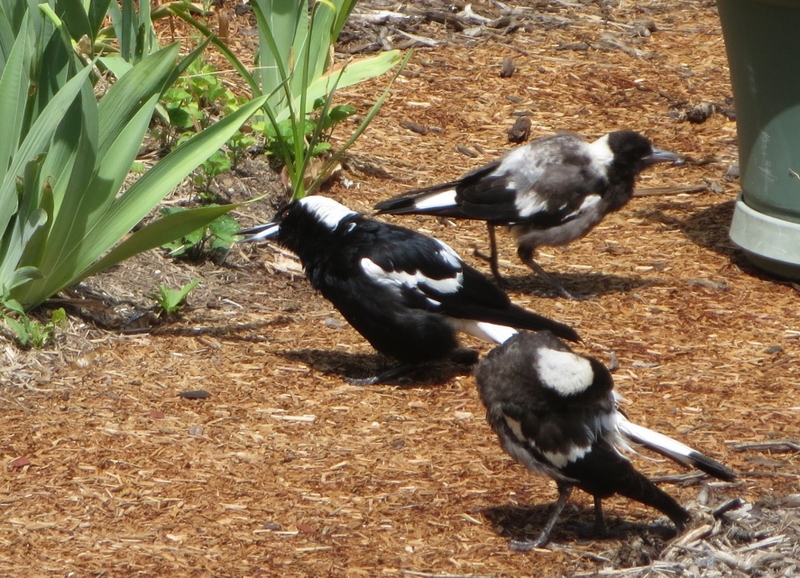 But the regulars in our garden are the Magpies, and this year a pair arrived with these three babies. Very soon it is obvious there are two fast learners…..
Dad’s having a bath…he’s had enough, he wants this baby off the payroll.. 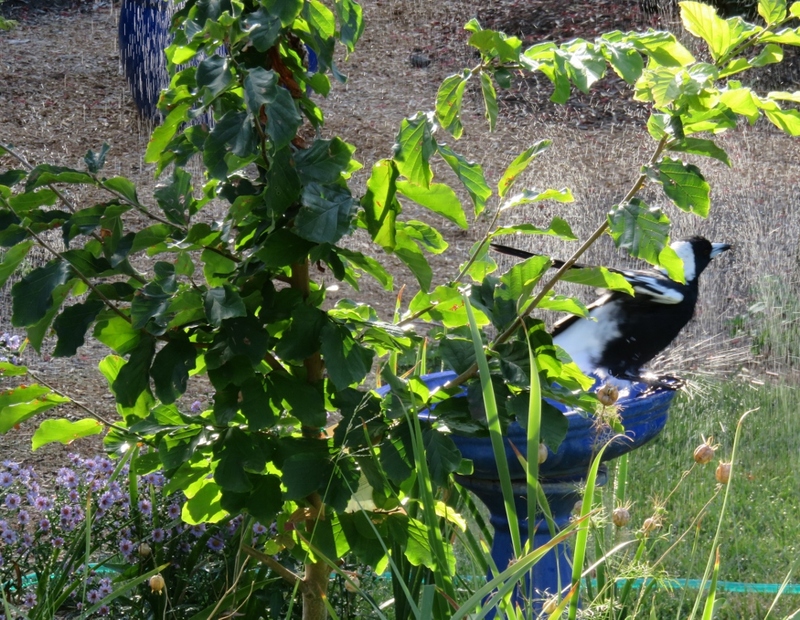 When we return from our summer holiday, the Magpies have gone…..in fact all the young birds have grown up and flown away…it’s very quiet here …I realise I’ve got the empty bird bath blues..
Then, just as I write this, the three young Magpies come back for a visit….they poke around the lawn looking for some worms, have a drink in the birdbath, and stay a while as we do some gardening..
HM Baby is turning her head to show she is listening for beetles, worms and grubs in the ground…she can feed herself! Just look at them! So confident, these city slickers in their sharp Armani suits…all grown up and ready to go….when did that happen? May they have a happy autumn and winter before their hectic turn at parenting begins.. 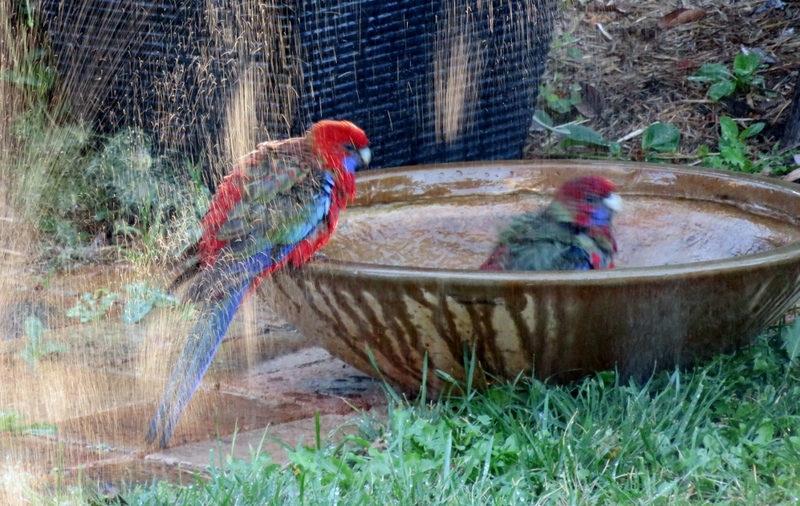 This entry was posted in Wildlife in the suburbs and tagged autumn, birdbaths, birds, cockatoo, crimson rosella, Eastern Rosella, Galah, garden, Kookaburra, Magpies, spring, sprinkler, water on April 7, 2016 by germac4. Glad you liked it Sandra, you would recognise the baby Cockatoos! 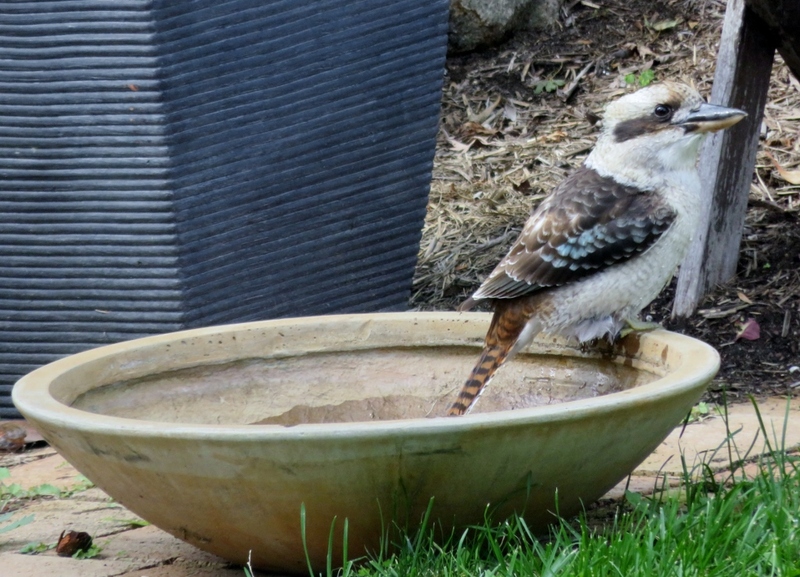 Nice to have the kookaburras back…cross fingers no more drastic cyclones! I’ve read that early settlers were terrified of the kookaburra call in the early morning until they got used to them and then they loved them! It is quite a unique sound! I’d miss all these delightful visitors too. I love your narrative and photos Gerrie. Thanks Ruth, it is fun to write posts about life going on around us! So many beautiful birds! I find their colours amazing, ours seem quite dowdy in comparison. Well, your beautiful pheasant is hard to beat. 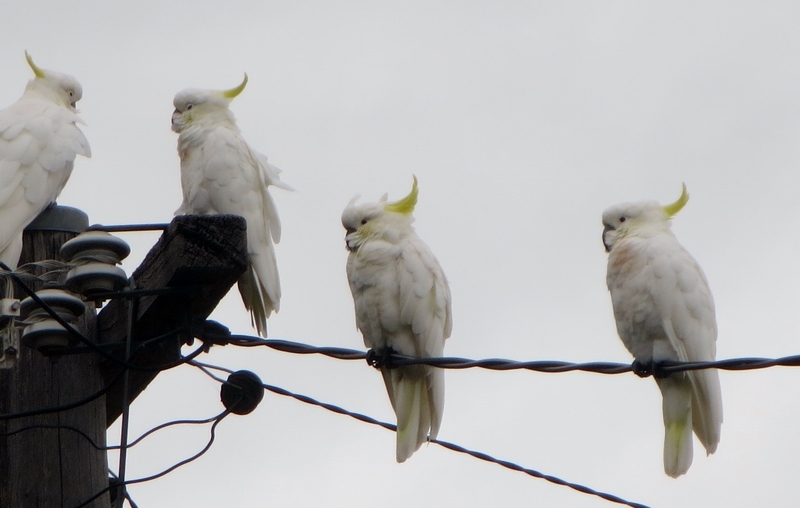 Most people who come to Australia comment on the noise Aussie birds make…deafening sometimes! G- what a sweet post! You and I both spoil our birds…albeit yours are so different than mine! I am looking at a new property today to downsize to, and wonder what my spoiled birds will do without me…perhaps I can ask them to move with me…all but the nasty, troublesome goldfinches…have them there? No we don’t have goldfinches, but we have a few nasty ones too. Are you really looking to downsize? what will happen to all your wonderful heritage bulbs? …and the birds, they will need a forwarding address….write a post when you find a new home. kookaburra is an attractive bird. with a large beak like a kingfisher? 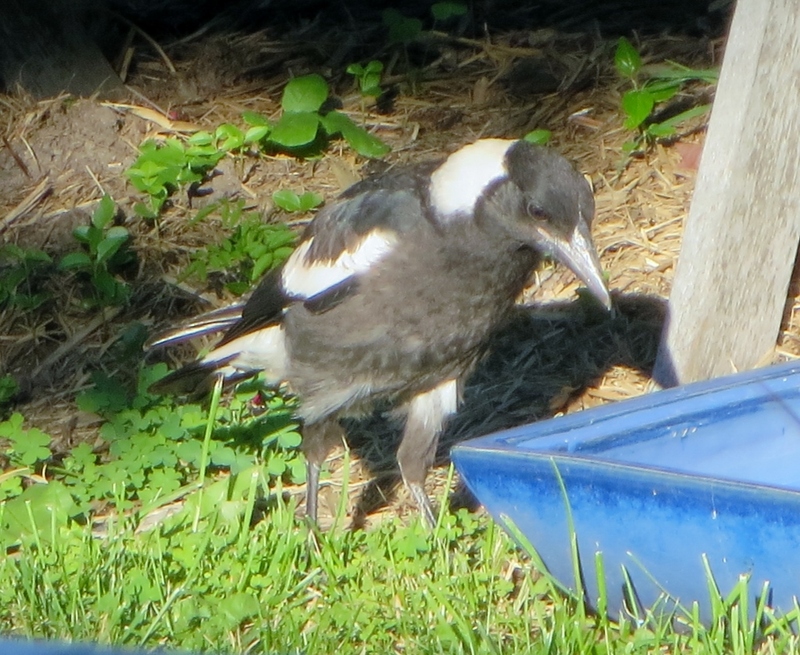 Yes, Kookaburras are a favourite here in Canberra. They are related to Kingfishers, the head shape is similar. I mentioned in another comment that early settlers were scared of the Kookaburra’s loud early morning cackle…but came to love it. 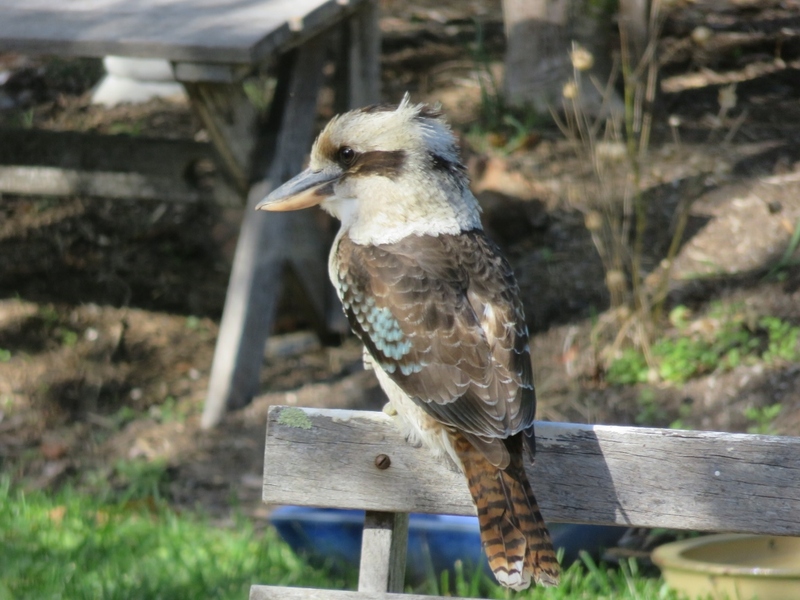 Thanks Dina, I agree the Kookaburras are particularly cute and they have only recently been coming to our garden. I’m sure they deserve a post of their own soon! What beautiful garden visitors you have down there! I’m so glad HM Baby finally grew up. Thanks Carol, yes I did wonder if HM Baby would make it…phew! Yes, HM baby made me think of so many parts of parenting…poor Mum giving in to HM…haven’t we all done that too! Glad you enjoyed it. 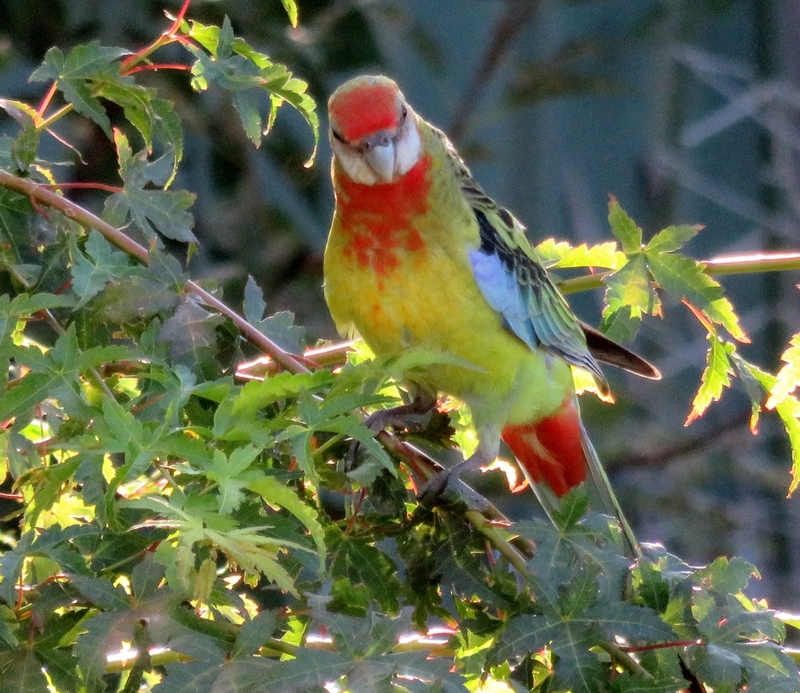 What magnificent birds you have – especially the cockatoos and crimson rosellas. Amazing color – and lots of personality, too! 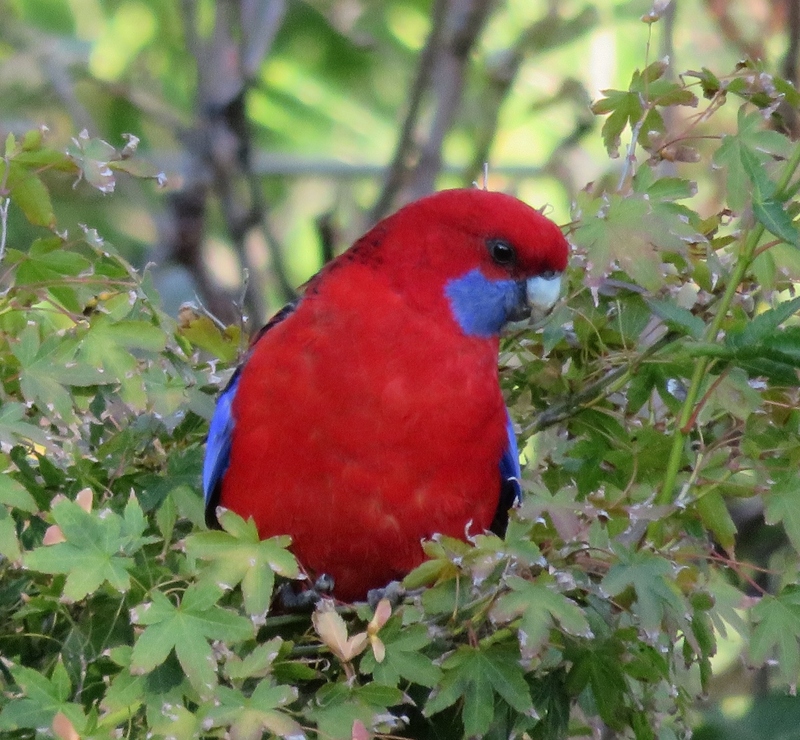 Yes, the crimson rosellas are very striking…and surprisingly they blend in quite well with the bush colours..
You are so lucky to have such a variety of birds visit you Gerrie. I’m quite envious. 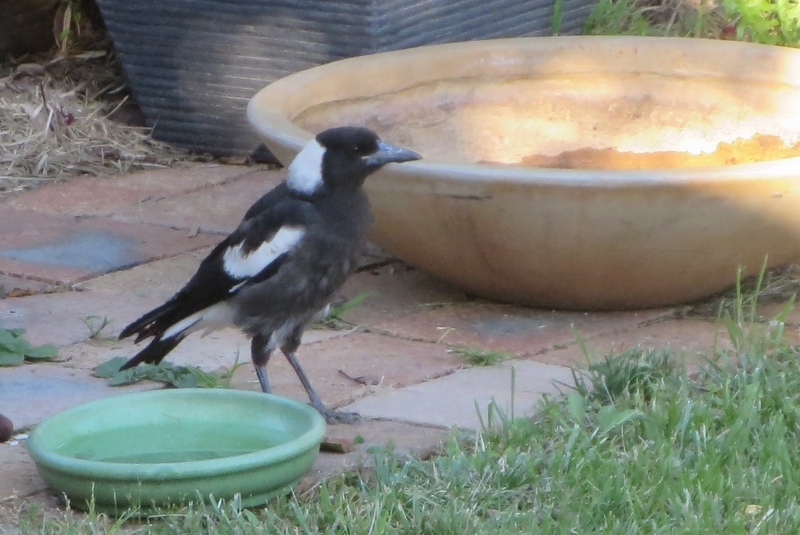 I used to have them a long time ago before 2000 then the prolonged drought brought all the black and white birds into town and the noisy minors gang up on everyone. I loved this post it made me smile. Thanks Pauline, glad you enjoyed the post. 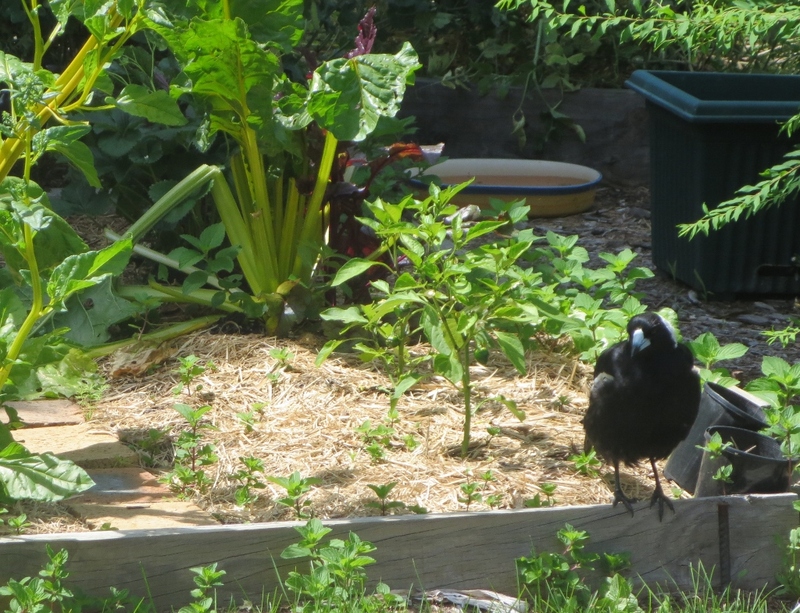 We do have problems with Currawongs flying in, but Paul chases them out (with a broom…surprisingly effective!) 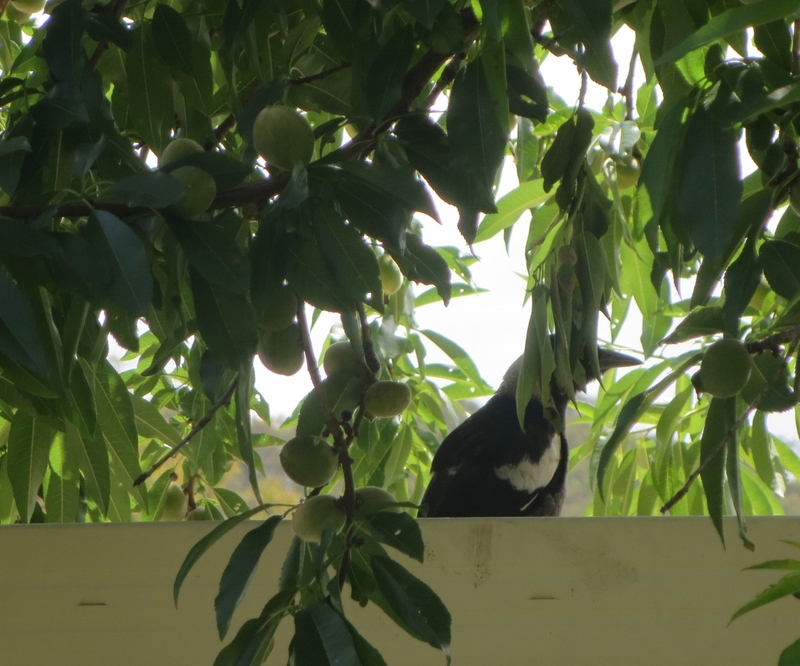 and Canberra does have a program to eliminate Myna birds….that is making quite a difference. I’ll have to google British magpies. 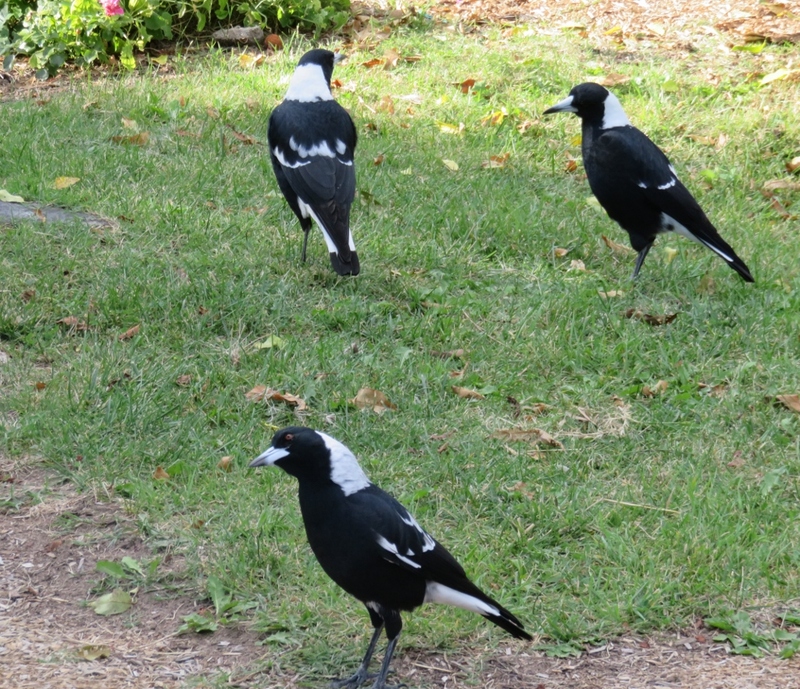 Here Magpies have slightly different colouring in coastal areas…the main feature of magpies in Canberra is that they love being with humans! What an interesting array of birds visit your garden! Parents are just starting to build their nests here. Just this morning I saw a pair of robins in the front garden and guess the nest building must be underway in the nearby evergreens. Yes, it is lovely to see birds regularly in the garden, and to follow their progress. Our neighbourhood is now filled with small trees and plants that give birds a chance to nest..it makes a big difference. Thanks for stopping by..